The Appaloosa is known world wide for its unusual spotted coat pattern. The breed has a wide variety of colors and body types due to the many different breeds involved in the early breeding of the Appaloosa. 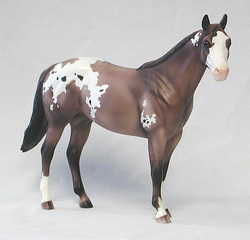 Modern day Appaloosas often have a certain percentage of Quarter Horse or Thoroughbred blood, as both breeds were used to refine the Appaloosa. "Pure" Appaloosas (as in 100% Foundation bred) are rare. If you are interested in knowing more about Foundation Appaloosas, be sure to read this page. Breed description: The 'Old Type' Appaloosas were tall, narrow-bodied, rangy horses, but with the introduction of QH, Thoroughbred and Arabian blood, the modern day Halter-bred Appaloosas very much resemble the American quarter Horse in body type. Sprint-bred Appaloosas resemble the Thoroughbred more. Appaloosas must show signs of carrying the leopard gene: spotted pattern, mottled skin, white sclera and striped hooves. Naming guidelines: No more than 20 letters including spaces. Names may not end in 'filly' or 'colt'. Names may not be names of famous people or famous horses. No vulgar or obscene names allowed. No numbers (Arabic or Roman), and no special characters such as $ or &. Our Appaloosa breeding program is currently quite small, but we do stand quality stallions and mares. Our horses carry mostly Halter lines with perhaps a dash of western performance blood here and there. The horses' pedigrees include both prolific American and Australian bloodlines and models from several different stables as well. We hope to expand the program soon with more stallions.